On Monday I was able to start cutting and sewing with the fun airplane print inspired fabric selection for a commissioned baby quilt. 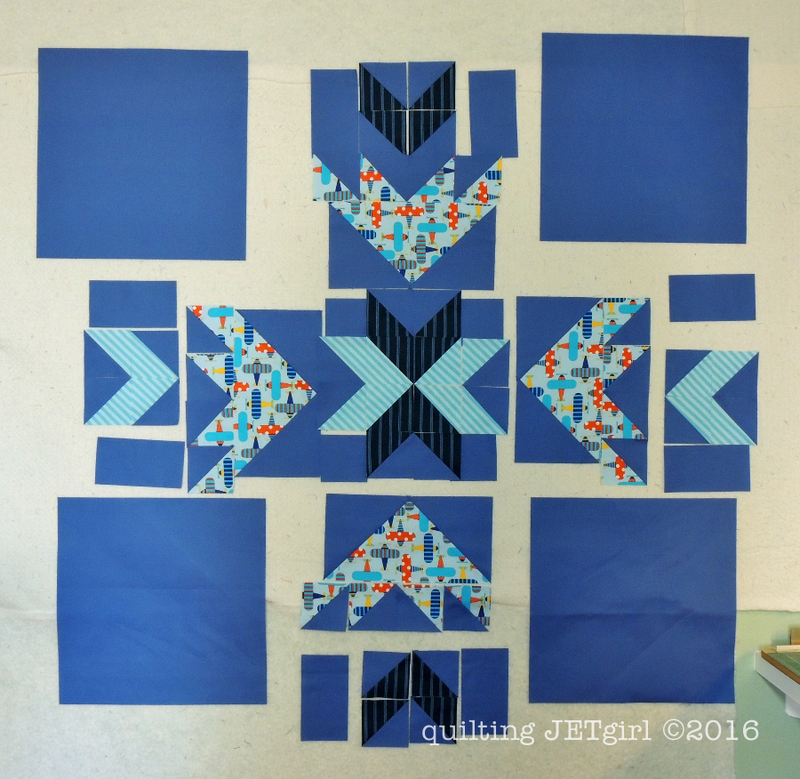 I am reprising the Flight Path baby quilt pattern from earlier this summer, and this time I am calling the quilt Ready, Set, Fly. To go from fabric to a pieced 42.5-inch square quilt top has taken me 3.5 hours. 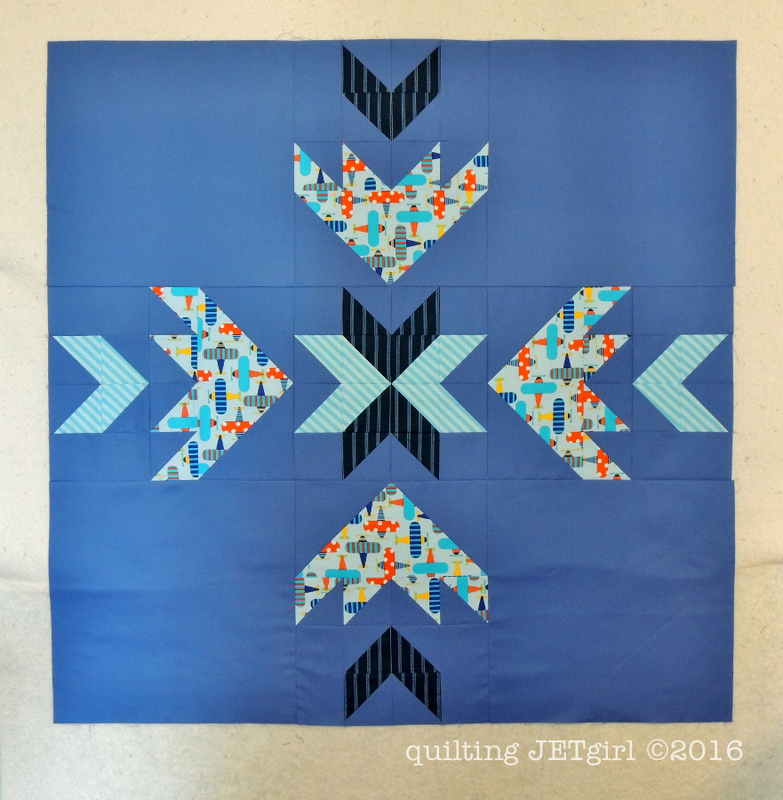 I pieced this version of the quilt top slightly differently than the last time so that I could use a large, single cut of fabric for the larger airplane print flying geese blocks. The quilt is all set up on my longarm and I hope to quilt and bind it today! I also love getting to see just how close the quilt top can match with the graphic design. Baby Quilt Commission <– In Work! Fabric and design matched perfectly, lovely fabric and your super pattern what a great finish. Oh, that’s the perfect pattern for this fabric! Beautiful! Looks like your wip list is coming along better than mine I had better get a move on I just added another QOL to the year as well… but my list still isn’t as long as yours! Looks like we both have to keep moving, 2 more months until January. Have a great day Yvonne! What a great title for your project. How fun! Good Morning Yvonne! This is a spectacular baby quilt! I really (my brain disability has frozen and I can not find the word I am wanting to use so I will go with) appreciate (but that is not a good one) the style of the layout. It totally brings out each and every fabric alone and together. Plus, the quilt makes me want to look at it over and over and just admire all of the artistic values and modern method of creating this spectacular quilt. Great job on completing so many of your to do lists. Thank you for sharing and have a fantastic creative day! Ready, Set, Fly is just beautiful. The pattern is so cool. The family and the baby will love it. Adorable! A perfect way to use those super cute kid prints without it overwhelming the quilt. The contrast that you added to the stars is great! You are rocking the to-do list especially with your upcoming trip! Looks great Yvonne. Your list is getting smaller at this rate you’ll make it by the end of the year. Now this is fun! I love what you came up with. The fabric was made for this adorable baby quilt. That has your Jet Girl signature all over it! Super quilt for a little pilot… now for the quilting! YOU are making great progress on your list! I like how this has turned out. I can see the planes…reminds me of when I was helping my son fold paper airplanes a long time ago. And good job on keeping focused on the finishes. I hope you are enjoying seeing that list dwindle. How fun to ‘whip’ out a quick quilt! And to have it look amazing! The new name for this one is perfect…it is so cute. What a lucky baby! Awesome baby quilt! I love the theme of it and how it reflects that in so many ways. The print, the shape of the pieces, the blue sky-like fabric. Wonderful! It’s beautiful, Yvonne! The airplane fabric is so cute and the design really allows a fun print to shine. That WIP list doesn’t stand a chance! Pattern and fabric go so well together. Great choice. Lucky little baby. I like how the flying geese look a bit like modern stealth fighters (to someone who knows nothing about aircraft)while the fabric has cute old-style aeroplanes on it. A fun mix of old and new! I love the fun airplane print. Taking the extra time to make sure that was a larger cut is definitely worth it. Can’t wait to see your binding in real life. I think it’s really going to tie the entire project together. This is adorable. What a great pattern. Super way to display a print without it overwhelming the quilt. Have you published this one Yvonne as I would love to make this pattern for a soon to be born little one.